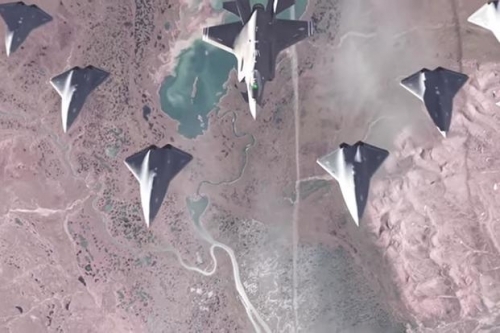 The Air Force Research Lab has unveiled a new video that gives a further glimpse into proposed ideas for sixth-generation fighters and various missiles, as well as drone swarming concepts and unmanned planes. The Air Force's leading research organization touts programs such as Loyal Wingman, Gremlins and the Counter-electronics High-powered Microwave Advanced Missile Project in the video, dubbed "Air Force 2030 -- Call to Action." "Today's research is tomorrow's Air Force technology," the video narration says. "The U.S. Air Force is seeking the next great research idea that will yield the next great Air Force capability." The five-minute video hinges on the idea that these developments are direct descendants of earlier programs, such as X-planes, which were experimental aircraft and rockets in the late 1940s that led to the first iteration of supersonic flight. For example, the video says data collected from the X-planes program led to the development of the F-22 Raptor and its fifth-generation flight capabilities. Similar data is being harvested today for future programs, including developments in the space and cyber domains, AFRL said. Loyal Wingman, or unmanned fighters that can think autonomously, will be sent out alongside F-35 Joint Strike Fighters to scout enemy territory ahead of a strike, or to gather intel for the pilot in the formation. A flight demo is expected sometime in 2022. Next-gen flight suits will monitor blood pressure, breathing, heart rate and muscle tension. Gremlins, or controlled micro drones, will drop out of cargo planes to swarm enemy defenses ahead of fighters, ships or ground vehicles. AFRL and the Defense Advanced Research Project Agency, or DARPA, anticipate a flight demonstration in 2019. CHAMP is a missile that emits high-powered microwaves to take out power grids and electrical systems without destroying infrastructure. The AFRL, alongside Boeing Co. and Raytheon, successfully tested the technology in 2012. Laser weapons are in development or prototyping for various aircraft such as the AC-130J gunship and the F-15 Eagle. The service plans to invest heavily in rapid research and testing for advanced aircraft and weapons. The Air Force's budget request for fiscal 2019 shows it is asking for $504 million next year for its next-generation air dominance research, development, test and evaluation program. It also has a planned investment of roughly $11 billion over the course of five years for RDT&E on next-gen air dominance, according to its future years defense program. The service in 2016 debuted its Air Superiority 2030 roadmap, which includes the sustainment of old fighters and new jets such as the F-22 and F-35, but also outlines next-generation air dominance, defined as advanced fighter aircraft, sensors or weapons -- or all of the above -- in a growing and unpredictable threat environment. The Air Force has been keen to move away from a "one-size-fits-all" mentality, instead developing a "family of systems" approach. Officials have said it helps when the service turns to the defense industry for contributions to the program. AFRL's video comes at a time when the service says it wants to clamp down on publicly showing or talking about its future technologies so that adversaries such as Russia and China can't capitalize on revealed secrets.